Check out the Leopard-Trek custom Nike Lunarglide 3’s! Love em! 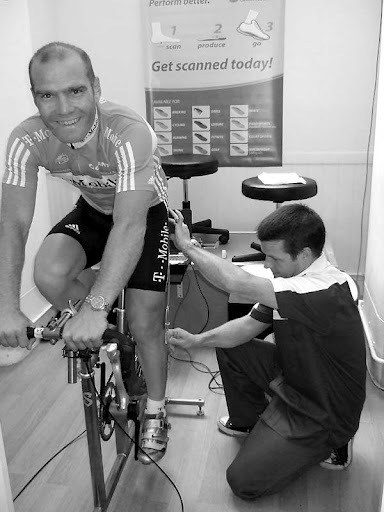 A few days ago I paid a visit to the Cyclefit outfit, based in London’s Covent Garden. I had decided to get my position looked over, but my main reason for the visit was to identify and hopefully correct the myriad of issues causing some stability issues in my lower half. I had developed what I termed ‘disco-ankle’ over the past few years, where my right ankle kicked out in a random motion every few pedal revolutions as my foot fought to find footing on the pedal axle. I suspected my shoes would require perhaps a shim or two, and I looked forward to having an expert properly set-up my speedplay cleats, the adjustable float not ideal for a self confessed fettler like myself to ever set up in a 100% satisfactory manner. It was over 2 years ago I last had a fitting and my shoes set up, at the very capable hands of ex-pro Adrian Timmis, now running the successful shop Cadence Sport full time. 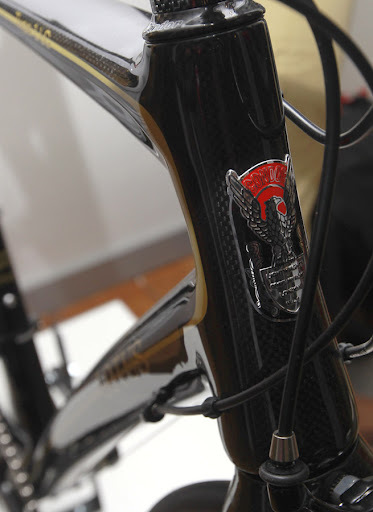 However in that time iv acquired a very different bike to the old aggressive bianchi, the Condor Acciaio. Im also running a vastly different pair of shoes, the S-works road show, compared to the old ill fitting Sidi genius 6 I wore at the time. So all in all lots of equipment and even body changes to address, hence seeking a set of eyes to yet again examine how I can eke more comfort and a little more efficiency out of my cycling. Ringing the buzzer at the shop-front of a discreetly pretty Covent Garden backstreet, I was met by Matt, Cyclefit fitter, and he ushered me inside to a well decorated unit. 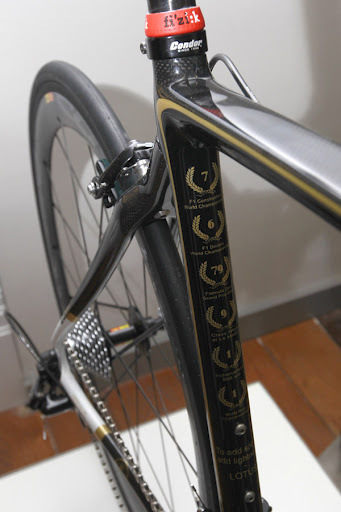 Delectable builds graced the walls from brands such as Passoni, Seven, Serotta and Guru. I took a seat, waited for my coffee and soaked up the gear p0rn. Not a bad way to start a Tuesday morning at 9am! The first part of the session was a sit down chat with Matt while he noted everything about my riding and riding past. Ambitions, injuries and bike measurements were noted in detail for input into my unique document (which to my delight was available after the session online). We spoke about my crash, around 3.5 years ago, and how it may have affected how I hold myself on the bike. I was then asked to pop up on the physio table, and I was stretched whilst matt recorded my flexibility (or lack thereof haha). I had tight hams and calves, which probably wasn’t aided by the fact I had partaken in a long run the evening before. Still, my feet angle, femur length and other measurements were taken down, and again placed in the rider document. I then had white dot stickers strategically placed to track my joints using their Dartfish motion capture software. Then it was time to mount the Ben Serotta designed SiCi (Serotta International Cycling Institute) fit bicycle and be recorded and observed. A laptop read out my efforts through each part of the pedal-stroke, and Matt circled the floor umming and ahhing, asking about any discomfort I was feeling. Matt then explained that my randomized ankle spazz-out, was actually in no small part down to an aggressive kick back up and into the pedal stroke. In effect Im failing to pedal properly, using my legs as vertical pistons, and instead trying to pull up and around on my upstroke, which Matt explained should actually serve as the recovery period of the pedal revolution. I explained I imagined this was down to being a bit obsessed with pedalling a perfect circle, and then it became apparent watching the video on the dartfish software that actually the pedalling motion is more of an vertical oval shape! So Iv come away trying to learn how to pedal properly, and after years of habit its actually incredibly hard to undo my bad habit! The laptop in front of the bike displayed some alarmingly red outputs on the graph that perfectly illustrated to me how I was yanking that foot back up to the top of the stroke. I spent a good ten minutes cycling on the SiCi trying to eliminate that horrid red bar from the screen, no small task! I opted to have the sidas custom insoles moulded for my shoes, in order to further stabilise my pedal-stroke. Having to jump onto a curious inflatable moulding system I apologised profusely for the state of my feet, looking battered and shrivelled due to having put in a large amount of running miles the past few months. I was assured that worse feet have been seen, although I suspect that this was a case of keeping the customer happy 🙂 Once in the correctly moulded insole, I definitely felt they were more firmer than the cushy flimsy stock footbeds in there already, and I knew these might take a bit of getting used to. Popping back onto the bike I instantly noticed how much more engaged I felt with the pedal, and definitely noticed an increase in my output, which in teaming with correct cleat placement and a shim in each, really enabled my to get that correct piston like tracking in my knees. My position was tweaked by a minute amount, less than a cm in the saddle fore position, but to be honest I was attending the session about 90% happy with my bike set-up, it was more to address the waist down issues and tracking, so I was happy that it reinforced I had the bike set up correctly in the first place (hats tipped to Condor and Sammy for that). We had a really good chat about the strengthening and conditioning that’s going to aid me this coming year, iv a lot to do in terms of getting my core solid, strengthening my back to avoid a recurrence of the bulged lumbar discs that ruined my cycling a couple of years ago, and also I need to work on getting my strong but very dormant glute muscles to fire on the pedal-stroke. Overall it was a really enlightening and worthwhile way to spend 3 hours as I look to enhance my comfort and performance on the bike this next year. I thought it was great how also each client is given the link to their fit videos and a cracking spreadsheet detailing rider history and changes to the bike/position. There’s no denying the pedigree of Cyclefit, and id thoroughly recommend it to anyone who, like me, felt ‘ok’ but not ‘quite right’ in the saddle. Whilst it is on the expensive side, its a really worthwhile investment in comparison to other things, and I don’t think you can put a price on comfort and the enjoyment not having those on-the-0bike niggles can bring. In this day and age, riders are dropping serious coin on bikes, clothing and shoes, so think about if you could benefit from a fitting session and if so, get to it. I plan to pen a follow up in around four weeks time when iv done some serious miles with my current setup, and il try and identify any real world change (if any, no matter how big or small) the fit has made to my riding. Iv just booked the tickets to head down and check out the very promising ‘Bespoked Bristol‘ show in March. After a superbly received 2011 edition the exhibition is back with a bang for 2012, with a bumper list of two wheeled ephemera on offer to drool over, from Pegorettis, to Condors, to boutique builders like Feather Cycles, Paulos Quiros and Donhues. 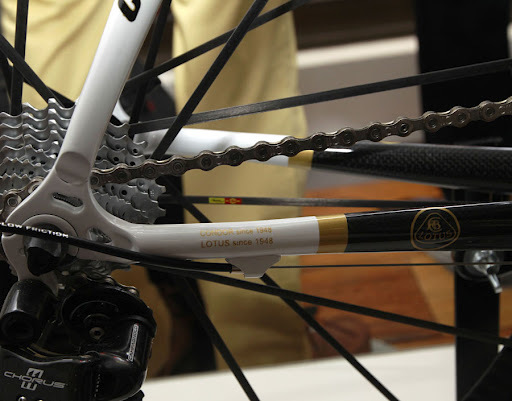 Expect a whole raft of accessories and hardware companies to be displaying their wares as well as the bike makers, ensuring the event is a hit with lovers of all things bicycle. Tickets are currently available over at the Bespoked website, with a cracking 2 passes for £10 on offer at the moment, a deal id advise the early birds to snap up. The venue is located right next to Bristol Temple Meads train station, making it easy for us out-of-towners. Us lucky London residents will be able to recognise the friendly faces of ‘Look Mum No Hands!’, who will be onsite providing all your caffeinated needs in their pop-up cafe. 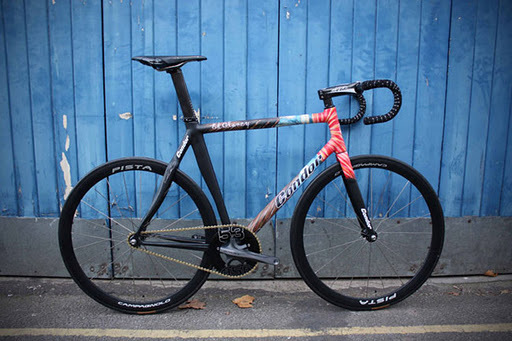 This year sees the inclusion of a test track to put some unique bikes through their paces, and also a framebuilders section, aiming to showcase amateur artisanal framebuilding. 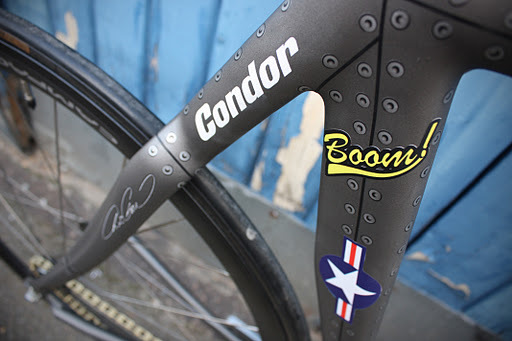 Condor are absolutely killing it with these special edition Super Acciaios. 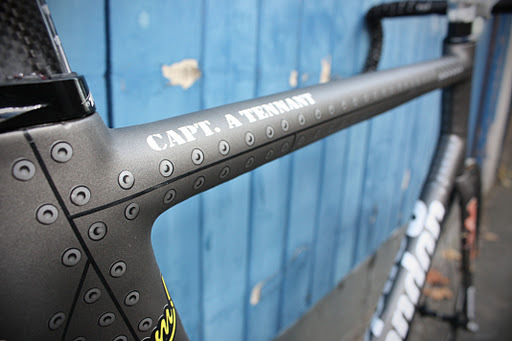 Rumour has it Deano & Jimmy will be racing them in the summer crit series…. 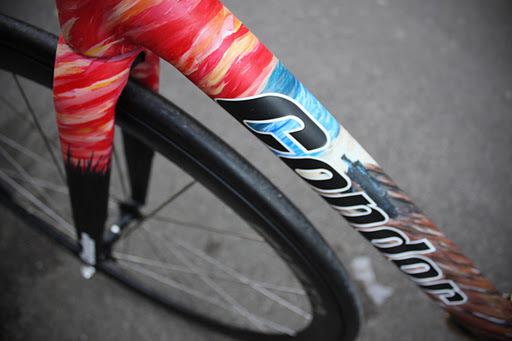 top notch detailing from the crew at Grays Inn Road, check out the condor emblem on the top tube! 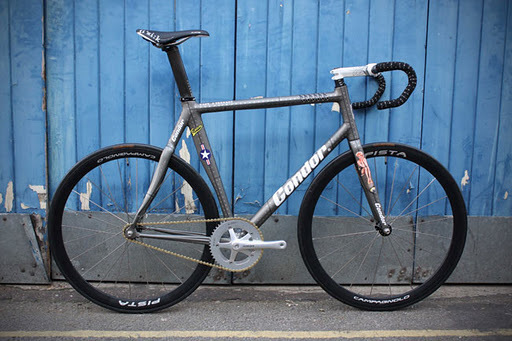 Condor have produced these amazing one off custom bikes for their star track riders and olympic hopefuls, Andy Tennant and Ed Clancy. 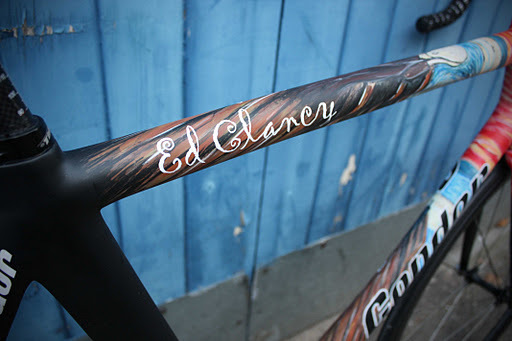 Claire has very kindly hooked me up with some images to share of the beautifully painted frames, with Andy opting for the stealth bomber number, and Ed riding the dream (or nightmare) inspiring ‘Scream’ by Edvard Munch! The lush paint-work is the handicraft of the talented Chris Grove, of Performance Race Art, who has undertaken two very diofferent design briefs and delivered truly unique bikes for top-class riders. Check out their website for the insane custom designs they produce. I have to say im a fan of the Clancy’s ‘Munch’ bike, just because its so unique and off the wall, but also its executed really well!